Boom Trucks - We can lift pallets and crates of building materials and land them in a wide variety of sites. Next to the truck is most basic but we can reach up to 69' away over an open excavation, into a garage door or sometimes through a doorway. We've lifted building materials to a brownstone front door as they were too heavy to carry up. Forklifts - Have you ever driven past a commercial building as a forklift buzzed around and thought about how handy they must be and what you could do with one of those amazing machines if you just had it for an afternoon? KST can bring along our forklift to offload ourselves or another truck on site. We can offload to pallets of brick in the city or sort material just where you'd like. Flatbed Trucks – whether you’re just moving materials around a jobsite or from one town to another, our flatbed trucks can make the job fast and easy. A flatbed means easy accessibility for loading and unloading and if you don’t have a forklift, we can provide that as well. Our short bed 35’ trucks are ideal for locations without much space or choose our longer 42’ and 45’ flatbed trucks for moving your longer materials. Lift Gate Trucks – once you’ve used one of our lift gate trucks for moving heavy items, you may never want to use a conventional truck again – just sit your materials on the tailgate and let the truck’s hydraulics do the lifting. Our lift gates have a capacity to 1200 lbs and can easily serve your city job sites with a few pallets of much needed materials. Think of it as a FedEx for pallets and short material up to 12' long! 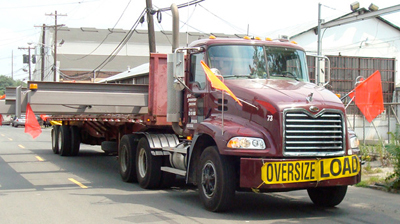 Kelly Springfield Trucking is also equipped to handle your oversized load needs in New York City and New Jersey and all of our trucks are fleet sized to comply with New York City and other local and state regulations. Many of our customers find that transferring inbound freight from road trucks to our vehicles can make delivery into New York City and the surrounding metro area much easier and can also provide specialized unloading equipment at the final destination. If your shipment arrives early, Kelly Springfield Trucking has short term outside storage where your materials can be staged until you’re ready for delivery. We can also accommodate just about any delivery schedule from early in the morning until late at night. Also, it is easier to arrange a truck to deliver here in NJ than into NYC. We can provide the Union labor many sites require to perform that last short run into the city. Kelly Springfield Trucking is centrally located in Newark, New Jersey and can be reached at 908-862-5215 or email us at info@springfieldtrucking.com. Call us for your trucking needs. Copyright © 2011 Kelly Springfield Trucking. All rights reserved.